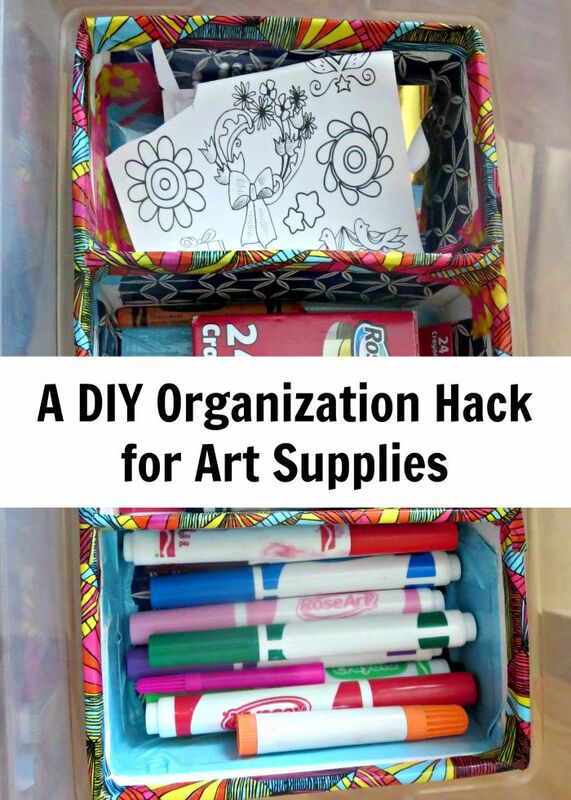 Are your or your kids’ art supplies getting out of control? Here is a frugal DIY hack to bring them back in order. Well, crayons did not really quit, but I was ready to quit on them looking at the state of Smarty’s desk. Her desk itself is also a DIY hack. My husband made it from IKEA IVAR shelves, and it’s adjustable in height and has space for plastic bins. Unfortunately, Smarty is not an organized child, and she has a hard time keeping it in order. Crayons, markers, and other art supplies roll and mix in her deep drawers, and are mostly just left sitting on the desk until Smarty wants to use her laptop again. Then she dumps them randomly into a drawer and fishes them back our for the next project. My crafty husband has decided that the system of plastic boxes could use some improvement. All that you need is some cardboard from old boxes, measuring tools, cardboard cutter, and duct tape to put boxes together and decorate them. He designed the cardboard inserts for plastic boxes to allow two rows of cardboard boxes in each pastic box to save even more space. He was hoping that Smarty will help him cut cardboard and put boxes together, but she was postponing this activity until he lost patience and did it himself. She did help to decorate the boxes with duct tape – they both said that it took longer than expected, but at least the boxes look fun. Will This DIY Hack Help? Smarty somewhat reluctantly tackled a monumental task of reogranizing her existing boxes into new storage. I want to hope that taking this ownership will help her stay organized, but, knowing my little daydreamer, I am not keeping my hopes very high. At least, she has more storage in her desk for unfinished projects that were previously floating all over the house. We made a deal to go through a straightening task once a week, the same way we straighten our house. It will also make it easier for her to keep all the materials needed for homework assignments in one place once she starts back in school. What are some of your tricks for keeping art supplies organized? Or perhaps you gave up on this altogether? Follow my Homemade Pinterest board Follow Natalie Planet Smarty Pants's board Homemade on Pinterest. We use empty cans for everything, and that seems to work relatively well. Ugg... The art supply mess. I just recently cleaned our up. Right now we use empty ice cream tubs. One for crayons and one for markers. Mason jars for pencils. I have done things like this, but mine weren't as pretty as yours! I actually just bought a craft supply carousel, but haven't brought it out yet. I also having the same problem with my daughter. i end up buying lot of containers from ikea! 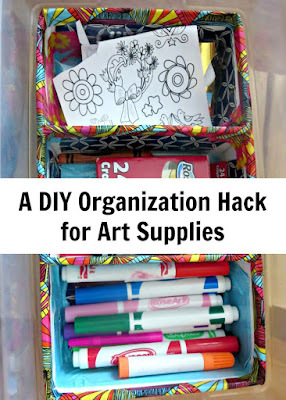 I use old Velveeta boxes along with a few other things to organize our art mess.